Impact Swaged wire rope gives you all the benefits of regular swaged wire rope, and then some! It has the highest linear density of all the cable we offer--simply put, it weighs the most per foot. This is the biggest reason it has so many benefits. 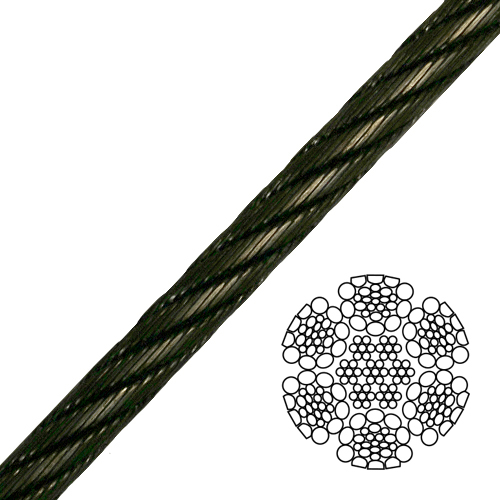 It is tougher and more resistant to abrasion than any other wire rope. It is the strongest wire rope we offer too. When spooled properly, it gives you the best resistance to drum crushing and snagging. It is very stiff because it is double compacted--the individual strands are compacted, and then after the wire rope is closed, it is compacted again. This makes it very stiff, yet very durable. It is ideal for skylines, skidding lines and droplines. Call us for additional sizes or to get a special quote for a large order.